The Green Roof Project installed two green roofs (over the east and west wings) on top of the Golda Meir Library in 2011. A crop of Sedum was planted, covering approximately 50,000 square feet. The east roof also features a 30-kilowatt system of solar cells sponsored by WE Energies, with the support of Focus on Energy grants. The Green Roof Project is a partnership with the Milwaukee Metropolitan Sewerage District. 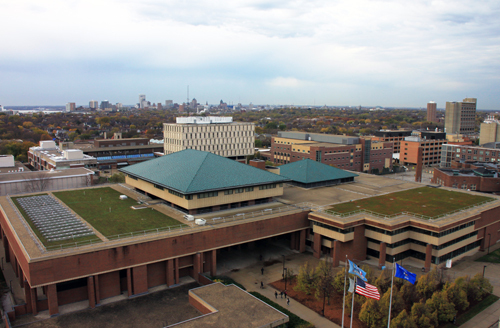 Information about other green roofs on campus can be found at UWM’s Sustainability site. Questions about the construction may be directed to Kim Silbersack.